The redox behavior for nano cadmium chloride (Ncc) was studied using cyclic voltammetry in the absence and presence of isatin (Isa.) on the use carbon glassy electrode (CGE) prepared in laboratory in 0.1M KCl electrolytic solution at two different temperatures . All cyclic voltamograms were carried at the selected temperatures in the absence and presence of isatin (Isa.). The redox reactions and reaction mechanism were suggested. All avialable cyclic voltammetry and thermodynamic data were calculated from cyclic voltammetry measurments and their values were explained .All the thermodynamic parameters necessary for the interaction of nano CdCl2 withisatin were calculate,explained and interapretatited. Heavy metal ions like cadmium ions are dangerous pollutants in environment [1-3].Some experimental methods for the removal of heavy elements are used with a combination for different techniques such as membrane and electrolysis [3-5]. The extraction of heavy metal ions as pollutants from water pollution, using electrochemical methods, is important [6-9].Several metal ions in solutions can be recovered by reduction at the cathode.The recovery and extraction of metals from Ni-Cd batteries have been studied [10,11].Cadmium ion is highly toxic and responsible for poisoning the food. Binding Cd with organic compounds is a treatment for remediation of Cd in vivo and vitro [12,13]. In this work electrochemical cyclic Voltammetry behavior of nano cadmium ions in chloride form was studied. The used chemicals CdCl2, KCl, Isatin are of high purity 98% of the Sigma Aldrish Company. Pure water was used after distillation. The cell has three electrodes connected to potentiostat DY2000 . Ag/AgCl ,KCl sat was used as reference electrode, carbon glassy electrode (CGE) was used as working electrode, and platinum wire as auxiliary electrode. The electrochemical studies were done in a potentiostat of the type DY2000.Flow of purified N2 was done to ensure diffusion experiment. The carbon glassy electrode (CGE) is locally prepared in our laboratory from pure carbon piece and polished with fine aluminium oxide on wool piece. Area of electrode is 0.502 cm2. All cyclic Voltammetry parameters are measured at the selected two temperatures 27 and 40oC using ultra thermostat of the type Assistant 3193. The nano cadmium chloride (Ncc) was prepared by ball milling method ,it is technically used for reducing material particle size.This nano cadmium chloride (Ncc) was prepared by being shaken in a ball-mill apparatus of type Retsch MM2000 swing mill for a period of two days. The mill contains 10 cm3 stainless steel tubes and Three stainless steel balls of 12 mm diameter were used. After the ball milling process which was performed at 20225 Hz at room temperature, the particles have a nano size. The nanoparticles were investigated using JEM-2100 TEM, Transmission electron microscope in Mansoura University. Fig. 1. 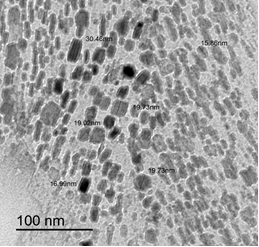 The TEM image of nano cadmium chloride (Ncc) from JEM-2100 TEM, transmission electron microscope. From this image with 72,000 X , we conclude that the nano cadmium chloride is in the form of a nano scale and dimensions of particles lie between 15.86 and 30.46 nm. Effect of cadmium ion concentrations for nano cadmium chloride (Ncc) was examined at two selected temperatures,26.5 and 40oC.Cyclic voltammograms for different concentrations from 3.3 × 10-4 till 1.96 × 10-3mol.L-1 in 0.1 M KCl were done . It was found that peak current gradually and linearly increases with increase in metal ion (salt) concentration due to the presence of ions active species at carbon glassy electrode(CGE) as shown in Figs. 2-4, at the two different temperatures. Fig. 2. 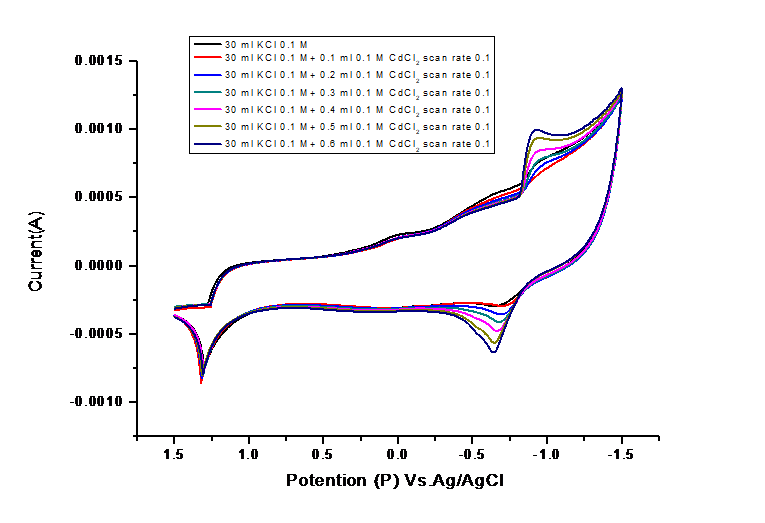 Different cyclic voltammograms for different nano CdCl2 concentrations in 0.1M KCl at 26.5 ˚C. Fig. 3. 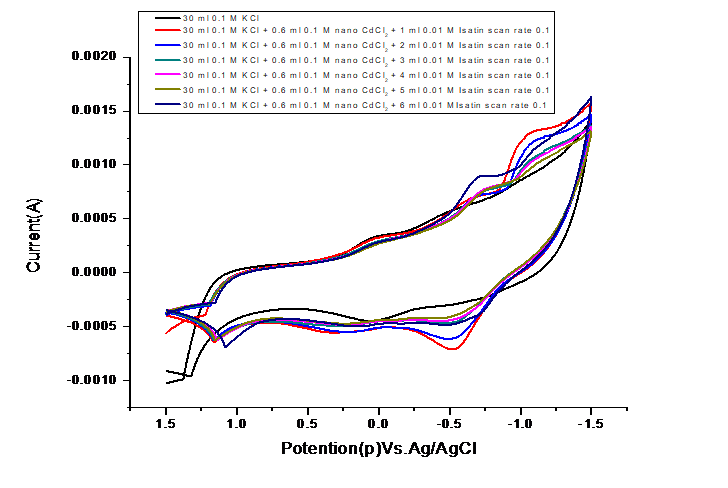 Different cyclic voltammograms for different nano CdCl2 concentrations in 0.1M KCl at 40 ˚C. Fig. 4. The effect of temp on redox behavior of nano CdCl2. Fig. 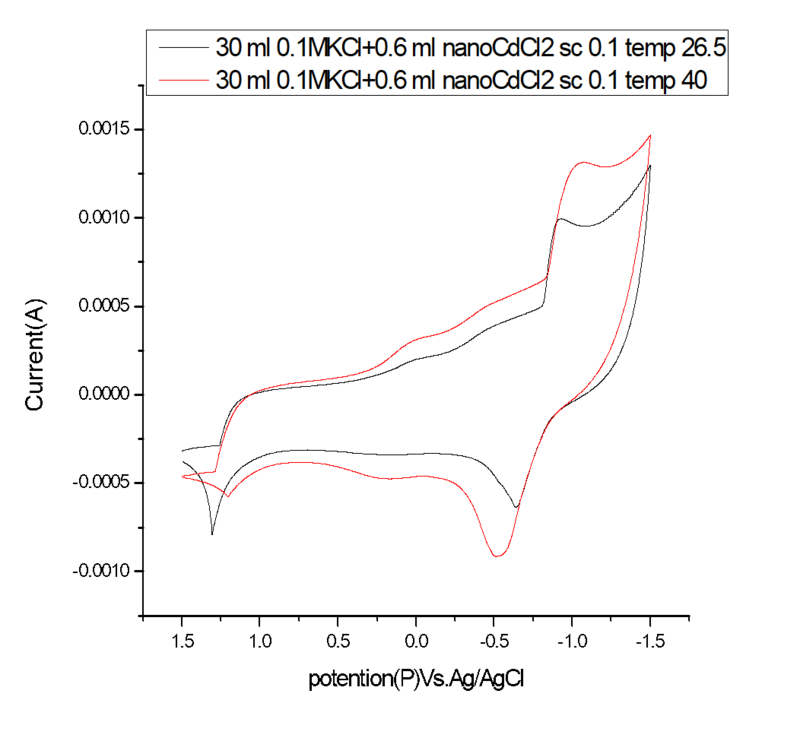 (4) illustrates the effect of raising the temperature on the redox behavior of nano CdCl2. It was observed that increasing temperature increases the peak current for the two redox waves. 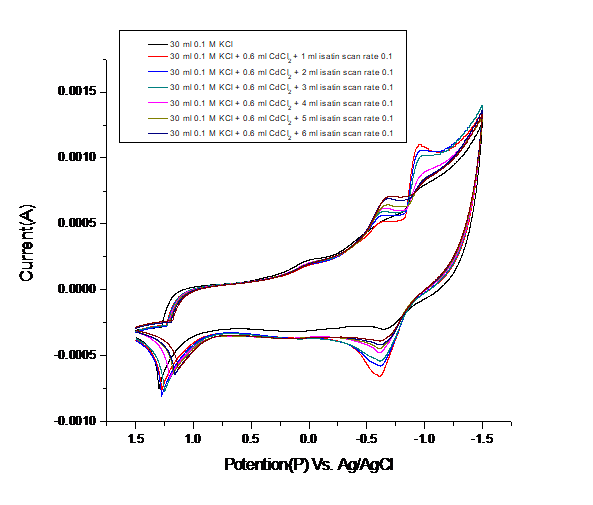 Effect of scan rate of the redox behavior of and nano CdCl2 (Ncc) in 0.1 M KCl was studied in the range 0.01,0.02,0.05 and 0.1(V.s-1) as given in Figs. (5) &(6). The different cyclic Voltammetry analysis data were calculated and the obtained data are Ipa (anodic current) , Ipc (cathodic current), ∆EP(difference in potentials), Da ( anodic Diffusion coefficient), Dc (cathodic diffusion coefficient), E 1/2 (half wave potential), Ks ( electron transfer rate constant ), Гa (anodic surface coverage), Гc (cathodic surface coverage), qa (anodic quantity of electricity) and qc (cathodic quantity of electricity) and 𝝰na (transfer coefficient). 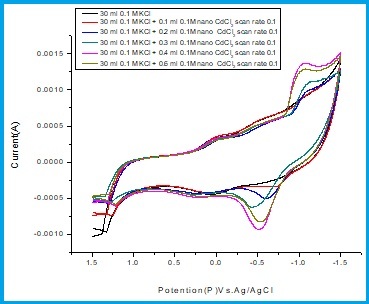 Quasireversible mechanism was observed for the redox behavior of bulk and nano CdCl2 (Ncc) in 0.1 M KCl from all cyclic Voltammetry CV analysis data and specially Ipa/Ipc . Increase of scan rate is followed by increasing in the diffusion parameters, especially, Ks,Гa,Гc ,qa and qc indicating the increased in the diffusion process by an increase in scan rate as the data given in Tables 1&2. Fig. 5. 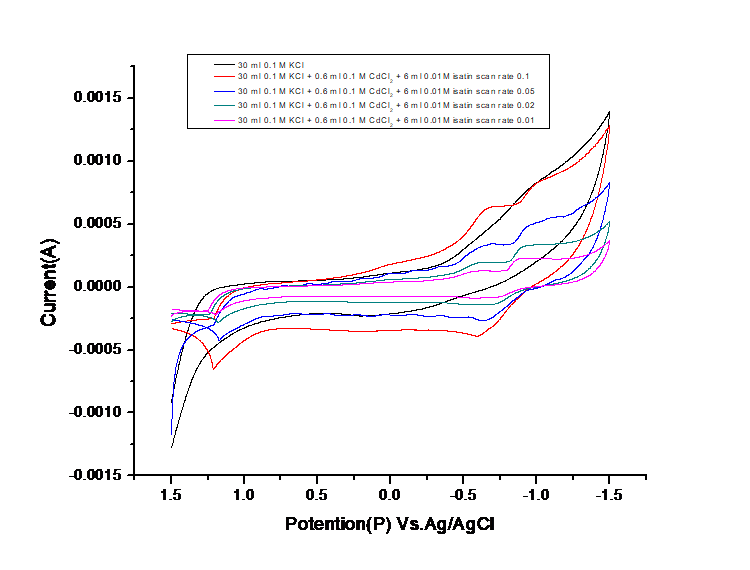 Different scan rates of 1.96×10-3 M nano CdCl2 at 26.5 ˚C. The relationship between log Ip and log 𝜈 giving straight lines indicate that the redox mechanisms are diffusion controlled for nano CdCl2 in 0.1M KCl. Randles Sevick equation was used for the relation between peak current (anodic and cathodic) and square root of scan rate which gives straight lines. In this sense, it indicates that the redox reaction is the diffusion process. Figs. (7) and (8) represent the electrochemical behavior of complex interaction between nano CdCl2 (Ncc) and ketone (isatin) in 0.1M KCl at the two selected temperatures 26.5 and 40oC. As shown from the previous figures by increasing the isatin concentration, the peak current decreases due to decreasing of concentration of dissolved cadmium ions at the carbon glassy electrode (CGE). Also, peak potentionl shifts to more negative values in case of oxidation and more positive value shift in case of reduction indicate complex formation. Fig.7. Cyclic voltammograms for interaction of 1.96×10-3 M nano CdCl2 and different concenterations of isatin at 26.5˚C. Fig.8. Cyclic voltammograms for interaction of 1.96×10-3 M nano CdCl2 and different concenterations of isatin at 40˚C. Figs. (7) and (8) illustrates that temperature causes more decrease in peak current (anodic and cathodic) which means that the complex formation reaction became more accelerated by increasing temperature. It is also worth mentioning that the reaction was an endothermic one. Effect of scan rate on the interaction between bulk,nano CdCl2 and Ketone Isatin was studied in 0.1,0.05,0.02 and 0.01 V.s-1 Fig.(9). Fig.9. 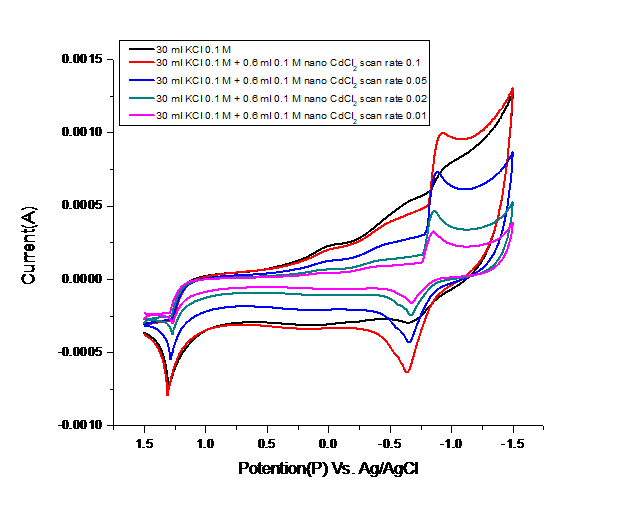 Different scan rates of 1.96×10-3 M nano CdCl2 interacted with 1.63 × 10-3 M isatin at 26.5 ˚C. Fig.10. The relation between log Ipc and log 𝜈 of 1.96×10-3 M CdCl2 interacted with 1.63×10-3 M isatin at 26.5 ˚C. Fig. 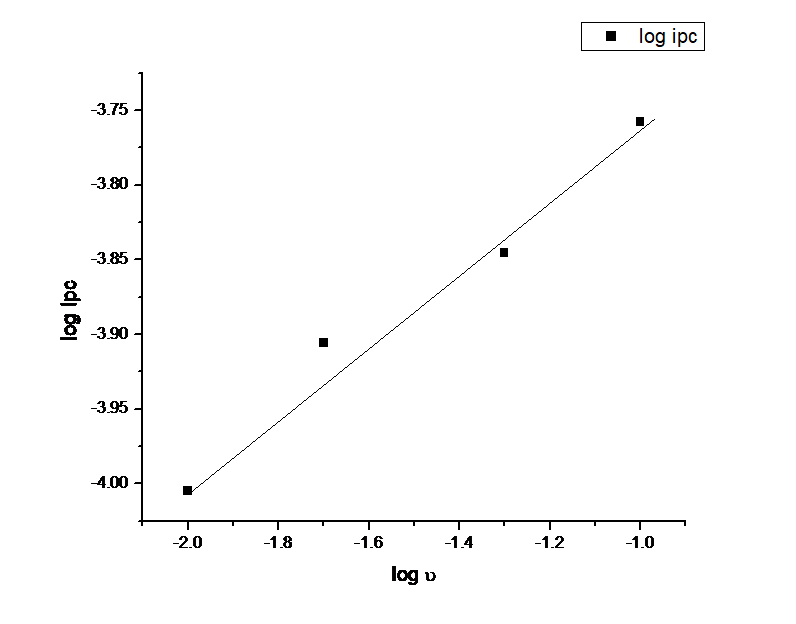 (11) illustrates the relation between log Ip and log 𝜈 for interaction between nano CdCl2(Ncc) in 0.1M KCl giving straight lines. Besides, it indicates the reversibility of the mechanisms and the redox mechanisms which are diffusion controlled. Randless Sevicek equation was used to apply the relation between peak current (anodic and cathodic) and square root of scan rate which gives straight lines. Fig. 11. 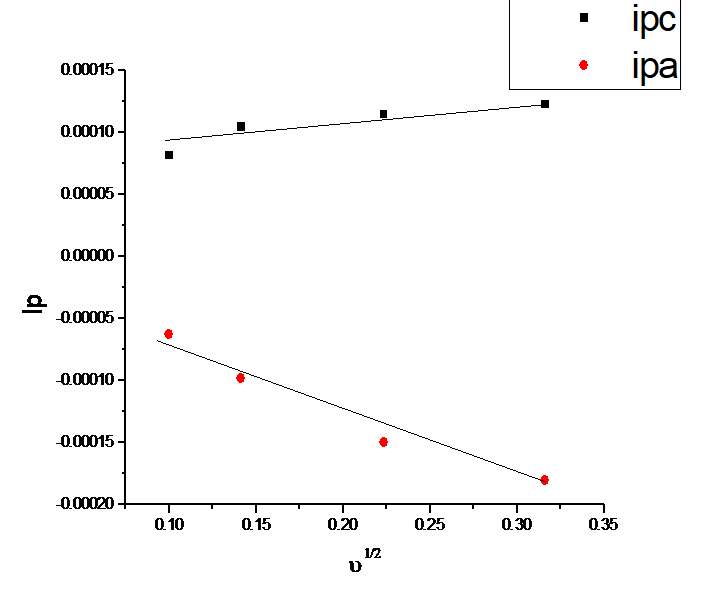 The relation between Ipc ,IPa and 𝜈1/2 of 1.96×10-3 M nano CdCl2 interacted with 1.63×10-3 M isatin at 26.5˚C. Table 1. 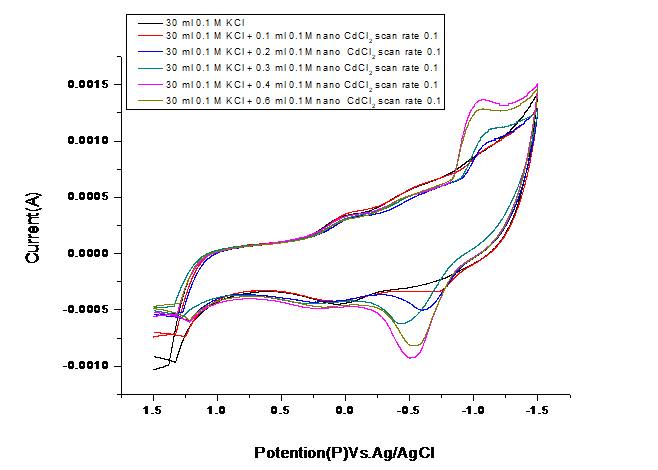 Effect of different scan rates for interaction between 1.96×10-3 M nano CdCl2 (Ncc) and 1.63×10-3M isatin(ketone) at 26.5˚C on the diffusion parameters. Table 2. Cont. effect of different scan rate for interation between 1.96×10-3 M nano CdCl2 (Ncc) and 12 "> 1.63×10-3 M isatin(ketone) at 26.5˚C on the diffusion parameters. Where ᵠ , charge transfer parameter taken as one for better approximation, 𝝰 charge transfer coefficient, Ks standard rate constant for electron transfer coefficient, 𝜈 scan rate, Da diffusion coefficient for the reduced species, Dc diffusion coefficient of the oxidized species, n electrons, F faraday constant, R gas constant and T is the absolute temperature for the experiment , 𝝰 = 0.5 which can be used for a good approximation for calculations, A is the area of the electrode used [25-31]. The complex stability constant measuring the strength and power of the interaction between CdCl2 and isatin (Isa) is important. The complexation stability constant ( 12Î²"> ) nano CdCl2 (Ncc) complexes in 0.1 M KCl are calculated by applying equation(7). Where (EP)M is peak potential for metal in absence of ligand, (EP)C is peak potential of the complex, R gas constant, CL analytical concenteration of ligand (ketone) isatin (Isa). Gibbs free energies of interaction, solvation of nano CdCl2 (Ncc) with ketone isatin (Isa) was calculated [19-26] using equation (8). Enthalpy (∆H) of complex formation reaction between nano CdCl2 (Ncc) with isatin (Isa) was calculated using equation (9) [29-31]. Where 12Î²1"> is a complex stability constant at lower temperature T1 (26.5 oC), 12Î²2"> is the complex stability constant at higher temperature T2 (40oC). From data in Tables 3,4,5 we deduce that interaction between nano CdCl2 and isatin (Isa) leads complex is formed with high stability , cleared from the values of 12Î²j . "> Increasing temperature accelerate complex formation in case of nano salt because values of 12Î²j"> at higher temperature are higher than at lower temperature.Enthalpy change are positive which indicate endothermic reaction.All the thermodynamic data support the formation of a complex between nano CdCl2 (Ncc) and isatin (Isa). 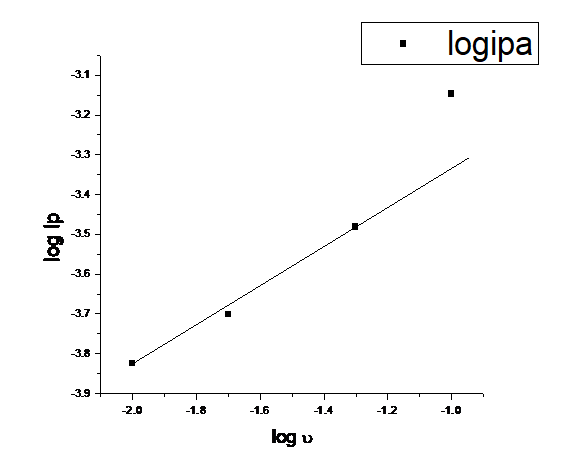 The relationship between log Ip and log𝜈 which gives straight line indicates the reversibility and the diffusion controlled mechanism. The redox reaction of nano salt was affected by temperature. The complex formation reaction was accelerated by increasing the temperature. How to cite this manuscript: Mohamed A. Morsi, Esam A. Gomaa * and Alaa S. Nageeb. Thermodynamic data (Voltammetrically) Estimated for the Interaction of Nano Cadmium Chloride (Ncc) with Isatin Using Glassy Carbon Electrode. 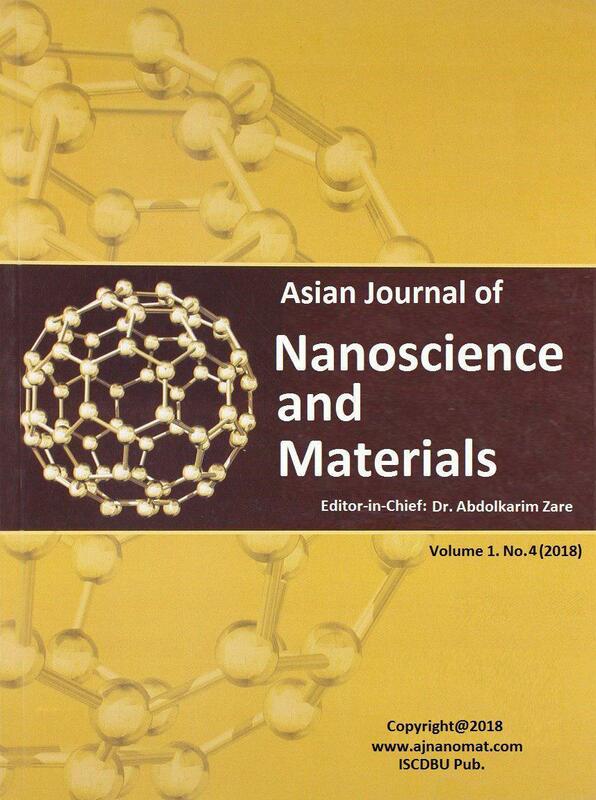 Asian Journal of Nanoscience and Materials, 2018, 1 (4), 282-293. Salata O. (2004) J Nanobiotechnol 2: 2-3. Christa M and Grozescu E (2009) Chem Bull Politechnica Univ (Timisoura) 54 : 68. Muataz Ali, Fegling Zhou, Kun Chen , Christopher Kotzur, Changlong Xiao, Laure, Zhang Xing, Bourgeois , Farlane Mac, Douglas R ( 2016)Nature Communications, Accepted 16 Mar. 2016, DOI: 10.1038/ncomms 11335. Saran S,Sharma g,Kumar Manoj,Ali MI (2017) International Journal of Pharmaceutical Sciences and Research 8:3887-3890. Gutten Ondrej and Rulisek Lubomir(2013) Inorg Chem 52(18): 10347 – 10355. Mounyr Balouiri, Moulay Sadiki, Saad Koraichi Ibn Souda (2016) Journal of Pharmaceutical Analysis 6 :71–79. Siraj Shaik, Madhusudana Rao Kummara, Sudhakar Poluru, Chandrababu Allu, Jaffer Mohiddin Gooty, Chowdoji Rao Kashayi, and Marata Chinna Subbarao Subha (2013) International Journal of Carbohydrate Chemistry Article ID 539636, 10 pages. Katherine B. Holt and Allen J. Bard (2005)Biochemistry 44 (39): 13214–13223. Lissi E, Modak B, Torres R, Escobar J, Urzua A (1999) Free Radic. 30 (6): 471-477. Freimoser F M, Jakob, C A, Aebi M., Tuor U (1999) Appl Environ Microbiol , 65(8): 3727-3729. Mauceri HJ, Hanna N N, Beckett M A Gorski D H, Staba M J, Stellato K A, Bigelow K, Heimann R, Gately S., Dhanabal M., Soff G A, Sukhatme V P, Kufe D W, Weichselbaum R R(1998) Nature 394: 287-291. Killa Hamada M (1985)J Chem Soc Faraday Trans I81: 2659-2666 . Conway B E (1966) Ann Rev Phys Chem 17: 481-528 . El-Khouly A A, Gomaa E A and Abou El-Leef E M (2003) Bull Electrochem 19(4):153-164. El-Khouly A A, Gomaa E A and Abou El-Leef E M (2003) Bull Electrochem 19(5):193-202 . Gomaa E A Abou Elleef E M and Mahmoud E H (2013)Eur Chem Bull2(10): 732-735 . Gomaa E A (2012) Int J Mater Chem 2(1) :16-18 . Gomaa E A and Al-Jahdali B M (2011) Am J Fluid Dynamics 1(1): 4-8 . Gomaa E A (2010) Analele Universitate din Bucuresti Chimie19: 45-48 . Gomaa Esam A (2012)Phy Chem Liq 50:279-283 . Gomaa Esam A (2012)Int J Mater Chem 2(1):16-18. Gomaa Esam A (2012) AmJ Polymer Sci 2(3): 35-38. Gomaa Esam A (2013) Eur Chem Bull 1 : 259-261. Gomaa Esam A, Abou Elleef E M (2013)Am Chem Sci J 3: 489-499 . Gomaa Esam A,Negm Amr E,Abu Qarn Reham M(2016) American Association for Science and Technology, AASCIT Communications 3,3 :177-183 . Gomaa Esam A , Abou Elleef E M (2013) Sci .Technol., 3: 118-122 . Gomaa Esam A, Zaky Rania R, Negm Amr E, Rashad Radwa T(2016) American Association for Science and Technology, AASCIT Communications, 3,5:224-230. Gomaa, Esam A, Negm Amr E,Tahoon Mohamed A (2016) European Journal of Chemistry7(3):341-346.